Just before her third birthday, Ava tested positive for MRSA in her nose, her story and how we eliminated it are at the end of this blog. 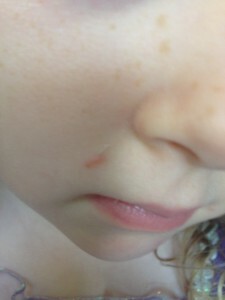 She also had staph on her finger that I was able to knock it out in 4 days but I didn’t take pics. The pictures at the end of the blog are of a cut that she got from a scratch from our dog’s paw when they were playing – I managed it like I would staph even though I am not sure what it was. There are 2 strains – community acquired and hospital acquired. Community acquired is the garden-variety which Ava had and is pervasive – the grocery store, the gym, schools etc. Community acquired is much less harmful than hospital acquired. The key differences between staph and MRSA is that MRSA are staph strains that have grown resistant to certain types of antibiotics. The good news is herbs work very well to combat MRSA. The second main difference is staph is much more common than MRSA. According to the CDC website, one in three people carry staph in their nose, usually without any illness. Two in 100 people carry MRSA. Staph bacteria are found in many places and are a natural part of the environment. MRSA is less pervasive, hospital acquired strain is mainly confined to hospitals and healthcare environments but the community acquired strain has been growing rapidly in the community over the last decade. MRSA can be harder to kill on surfaces than staph. Once you have had MRSA you are more likely to get it again. Some people are carriers, and have the presence of it on them at all times. For people who are carriers and do not have an active infection, conventional medicine does not treat them because the thought is that they will always be a carrier. MRSA is highly contagious. Wounds should be bandaged. There are a bunch of other precautions you should take like not sharing hand towels. You can get lots of info on this via a google search. MRSA can develop into pneumonia, contaminate the blood stream and in extreme circumstances lead to sepsis. Many herbalists believe that when you have an MRSA infection on your skin, you should treat the body because it is probably in the blood system even if you do not display symptoms of this. If MRSA is in the nose, it could be in the lungs. This is my personal belief. My other belief on this is that if a child gets community acquired MRSA, you should take a look at their immune system in general. We are all exposed to it, some kids get it, others don’t. For example, if your nasal cavities have a healthy vital environment with lots of friendly bacteria, then it is my opinion, you should not contract it. The same cannot be said of hospital acquired MRSA, even the healthy are susceptible to this virulent strain. Silver shield gel (pictured on left) – This is one of nature’s most potent antibiotics but it is strong and it kills good bacteria with the bad, plus it is a metal although the nanoparticles of Silver Shield are easily metabolized out of the body, that is still a consideration. I used this because I would not feel comfortable putting any of the treatments below in Ava’s nose. As pictured on left, I used silver shield for an infected spot on Ava’s face recently as I was concerned about getting Thieves essential oil close to Ava’s eye. Thieves essential oil – when Ava had what I considered a staph infection on the crook of her finger – it was an elevated pustule with an angry red ring, it was the textbook picture of staph. I used diluted Thieves at 10%, 4-5 times a day. I bandaged it with gauze each time. It resolved within 4 days. Manuka honey – produced in New Zealand by bees that pollinate the Manuka bush, this nutrient dense honey has been used medicinally for thousands of years and has been found while escavating the tombs of Egyptian royals. It is one of Nature’s richest antimicrobials. Bentonite clay paste – bentonite clay is fantastic at binding to toxins and drawing out infection. I also use this to get splinters out. Garlic – this common kitchen herb is a potent anti-bacterial. You can crush some to release the allicin and put it on for 15-20 minutes. Garlic can burn the skin so caution needs to be exercised especially with little ones. I have never put this on Ava for that reason. However, when a family friend had a elevated boil that was very painful and pulsing which he had had for weeks, I crushed garlic put it in Manuka honey and gave him saran wrap to hold it in place. After 20 minutes the boil burst and the pain dissipated and it healed from there. Medicine straight from the kitchen! Propolis – is a red or brown substance made when bees collect resin from trees and combine it with a little honey. They use this resinous material to seal small cracks in the hive to keep out dangerous microbes and fungi. It is one of nature’s antibiotics and possesses antibacterial properties. This can be applied topically as well as taken internally. This is a favorite of Dr Michele Sayball ND for treating staph. Usnea – usnea has a particular affinity for staph/MRSA. Usnea is a lichen which is an algae fungus combination. It is an antimicrobial, antibacterial, antifungal and a vulnerary (promotes wound healing). This is recommended for staph by both Naturopath and Herbalist, Darryl Patton and Herbalist, Pat Harpell. Garlic – is one of Mother Nature’s weapons against infection of any kind. I love Nature’s Sunshine SynerPro Garlic because it is so potent but chewing on a raw clove of garlic will also reap great benefit. It is important to chew because when garlic is crushed (vs chopped), the allicin is released. Allicin is not present in the whole garlic clove, it is only created when the garlic is crushed, called the ‘allicin release’. It is allicin which possesses many of garlic’s infection fighting and antioxidant properties. 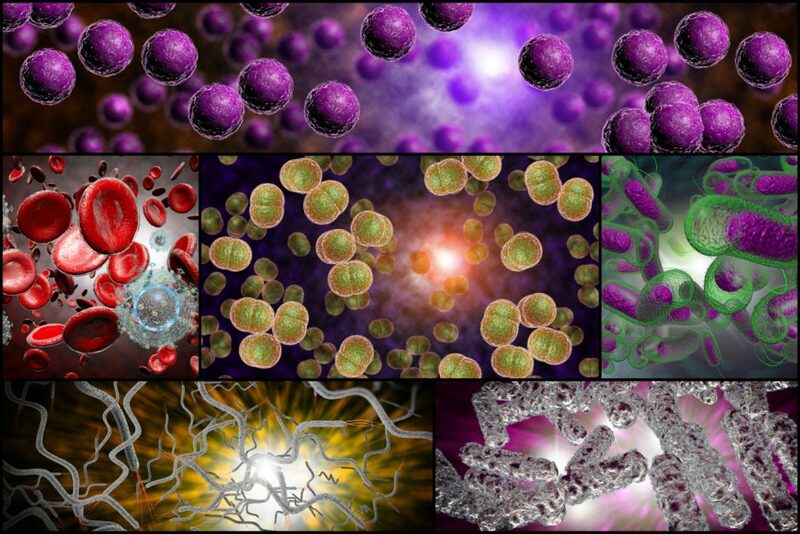 Probiotics – the gut houses 70% of the immune system. Give the body good bacteria to fight the bad bacteria. I give probiotics 2 hours after the garlic and OLE so they don’t kill off so many of the probiotics. We alternate between Cytoflora and GutPro. Liposomal Vitamin C – this is a very potent form of Vitamin C. Vitamin C is water soluble and just like oil and water don’t mix, Vitamin C has a hard time penetrating the cell membrane which is composed of fatty acids. This incompatibility means that Vitamin C is not easily assimilated and utilized within the cell. Estimates of Vitamin C absorption into the blood stream are around 20%. By wrapping the Vitamin C in a fat (lypo) that mimics the cell wall structure, liposomal Vitamin C is significantly better absorbed, with some estimates ranging higher than 90%. Liver cleanse and yellow dock root – these support the liver in throwing off the toxins. Burdock root, dandelion root and milk thistle are other options that assist the liver. BP-X – This powerful blend by Nature’s Sunshine is a traditional blood purifier (hence the “BP”) formula created by the famous herbalist, Dr John Christopher. It contains burdock root, yellow dock, dandelion which all support the the liver and are also blood purifiers which will help cleanse the body of the toxins. This blend also contains red clover, another potent blood purifier and lymphagogue (promotes lymph flow). BP-X has been used as a remedy for skin eruptive diseases and problems with the liver and gallbladder. It stimulates the flow of bile to clean the liver and gallbladder. In addition to poison ivy, BP-X has been used for abscesses, acne, blood poisoning, boils, eczema, psoriasis, rashes and hives. It also helps maintain healthy bowel function. This is suitable for children over 2 years old (in appropriate dosing, of course). This is not suitable during pregnancy or while nursing because it is a detoxifier. Just before Ava turned 3 years old, a nasal swab showed the presence of MRSA (Methicillin-resistant Staphylococcus aureus) in her nose, it was not an active infection. She had sinus issues for a few months prior which was unusual for her. I was able to get it under control but she constantly sounded “nasally” where she had not before. She was also somewhat lethargic which was disconcerting. I hit google and read that possible causes were the presence of mold and staph in the nasal cavities. I went to the Doctor who informed me that “She looks fine” “She seems to have plenty of energy” “There is nothing wrong with you daughter. Relax.” I am not sure why people say tell others to “Relax”, it is one of the most condescending, least helpful, just sheer annoying directives! Plus commanding someone to “Relax!” has the exact opposite effect. I told the Doctor that I would still like Ava tested for staph in her nose, via a nasal swab. He told me that was ridiculous, she was clearly fine, he didn’t want to subject her to an unnecessary nasal swab and anyway, he had never done one and didn’t know what to do. We went back and forth, 3 times. Finally I had to play the weak female card and smile, and say “Doc, could you just do it please to make a worried mother happy”. That worked. Uggh!! Dr. Relax called me back days later. 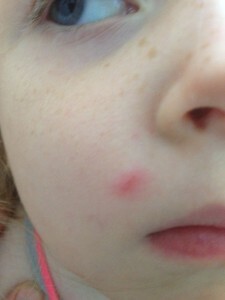 Ava had tested positive for MRSA. Did he mention the fact that he didn’t want to test her for it….no! Even though I suspected it, I still couldn’t quite grasp the fact that my 2 year old with her cute pigtails was home to such a nasty bacteria. Time to pull up those big girl pants again and move forward…MRSA is interesting, you mention it to some, they act like it’s the plague, others think of it more like a cut knee. 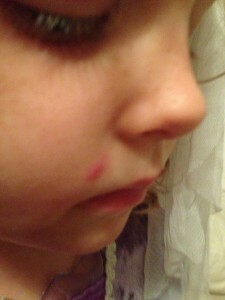 Because Ava had the presence of MRSA in her nose and not an active infection, Dr. Relax, told us we did not have to do antibiotics and we could treat with an antibiotic gel to be inserted in her nose. In fairness to Dr. Relax, he was fine when I told him I was going to try colloidal silver (my silver shield) first. I felt confident it would work, it is so powerful. I went home and headed straight for Silver shield, for my purposes I used the Silver Shield liquid as I wanted to put liquid drops in Ava’s nose but for wound care Silver Shield gel is better. Silver shield is somewhat like colloidal silver but unique. Silver Shield works because each of its ion’s shell is missing 2 outer electrons, so the supercharged silver then pulls 2 electrons from the cell membranes of harmful bacteria, thereby rupturing the cells and destroying them. It is purported that it does not pull electrons out of good bacteria. I love Nature’s Sunshine and Silver Shield is one of my favorite products of all time, it has never let me down, but I do question that. It would seem to me that something so powerful is going to also damage some healthy cells. I am going to look into this down the road. Silver shield has a unique resonance that enables it to destroy viruses, bacteria, and yeast. The frequency is actually in the same range as blue germicidal lights used in hospitals. 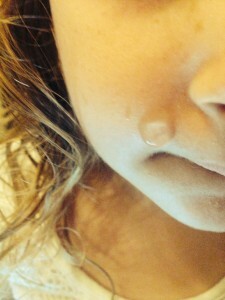 We had Ava put her head over the side of a bed and I put 2-3 drops in her nose 3-5 times a day. I try to gentle parent most of the time although I am not always successful! Ava will take pretty much any herb or tincture, I don’t have to hide them in apple sauces or juices but she drew the line at having drops placed in her nose. My poor baby, it was not pretty, gentle parenting hung its collective head in sorrow when we administered the first drops but it did get easier after that. It still took both my husband and I to administer it and he was traveling so I missed a few days of dosing but in total I would say I did 2-3 drops in each nostril over 6 days between 3-5 times a day over a 10 day period. When we re-tested she was MRSA free! 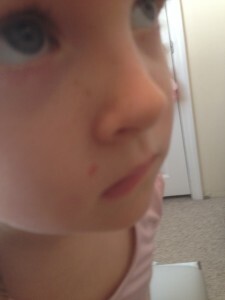 Right now, we are working on other things but in a year from now, I will re-test her nose for MRSA. Update Dec 2016: We re-tested Ava’s nose for MRSA and she is MRSA free – that was really great news because once you have had MRSA, you are much more susceptible to acquiring it again. This was a cut from a scratch from one of our dogs while playing – it was infected although I cannot be sure it was staph. However, this is to show you how effective and quick acting Silver Shield is. Pic 1: Day 1, I noticed the cut on her face had grown red and angry so that day I applied 3 topical treatments of silver shield gel 2-3 hours apart. Pic 2: Day 2, the next day, the redness was gone. The cut looked benign so I decided to let her body do the rest of the healing and I stopped treating it. Mistake! Pic 3: Day 3, cut is getting red again so I treat 5 times every 2-3 hours. Pic 4: Day 4, redness is gone from around the cut. I applied the silver shield 3-5 times a day for the next few days and it was gone in 3 or 4 days.